Two new papers published in the Astrophysical Journal describe the process of hydrocarbon creation on Saturn’s moon Titan and predicted how long Titan’s chemical factory has been running by modeling how concentrations of methane on the surface change over time. 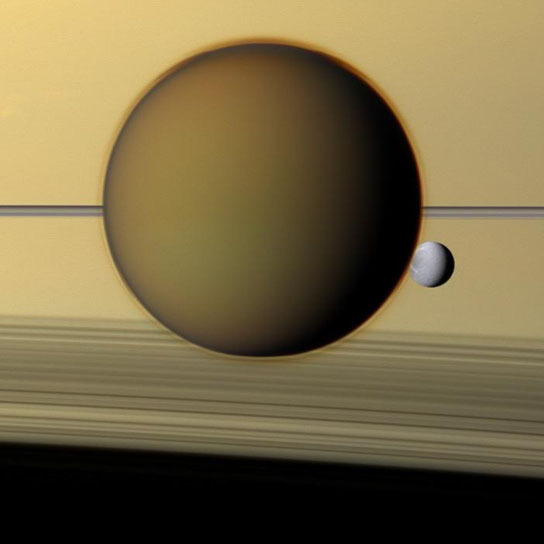 The papers are backed by data from NASA’s Cassini spacecraft and the European Space Agency’s Huygens probe that landed on Titan’s surface in 2005. Saturn’s giant moon Titan hides within a thick, smoggy atmosphere that’s well-known to scientists as one of the most complex chemical environments in the solar system. It’s a productive “factory” cranking out hydrocarbons that rain down on Titan’s icy surface, cloaking it in soot and, with a brutally cold surface temperature of around minus 270 degrees Fahrenheit, forming lakes of liquid methane and ethane. However the most important raw ingredient in this chemical factory – methane gas, a molecule made up of one carbon atom joined to four hydrogen atoms – should not last for long because it’s being continuously destroyed by sunlight and converted to more complex molecules and particles. New research from NASA-funded scientists attempts to estimate how long this factory has been operating. The results are presented as two papers appearing in the April 20 issue of the Astrophysical Journal. These papers used data from two instruments onboard NASA’s Cassini spacecraft in orbit around Saturn and one instrument on the European Space Agency’s Huygens probe that landed on Titan’s surface in January, 2005. All three instruments were built at NASA’s Goddard Space Flight Center in Greenbelt, Md. 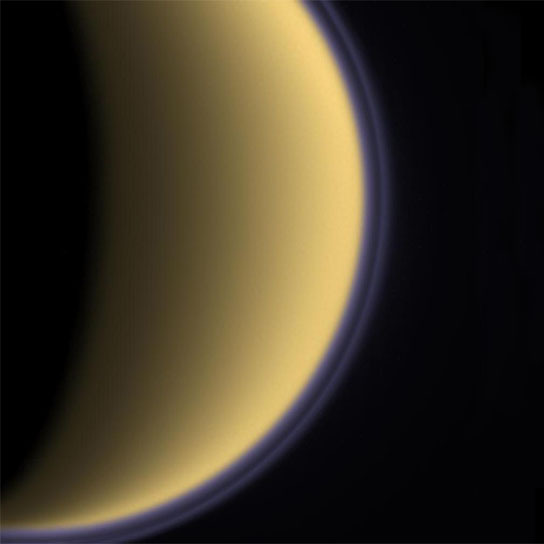 A paper led by Conor Nixon of the University of Maryland, College Park uses infrared signatures (spectra) of methane from Cassini’s composite infrared spectrometer to estimate how much “heavy” methane containing rare isotopes is present in Titan’s atmosphere. Isotopes are versions of an element with different weights, or masses. For example, carbon 13 is a heavier (and rare) version of the most common type of carbon, called carbon 12. Occasionally, a carbon-13 atom replaces a carbon-12 atom in a methane molecule. Because methane made with carbon 12 is slightly lighter, the chemical reactions that convert it to more complex hydrocarbons happen a bit faster. This means carbon-12 methane gets used up at a slightly faster rate than heavy carbon-13 methane, so the concentration of heavy methane in Titan’s atmosphere increases slowly. By modeling how the concentration of heavy methane changes over time, the scientists predicted how long Titan’s chemical factory has been running. “Under our baseline model assumptions, the methane age is capped at 1.6 billion years, or about a third the age of Titan itself,” said Nixon, who is stationed at NASA Goddard. “However, if methane is also allowed to escape from the top of the atmosphere, as some previous work has suggested, the age must be much shorter – perhaps only 10 million years – to be compatible with observations.” Both of these scenarios assume that methane entered the atmosphere in one burst of outgassing, probably from the restructuring of Titan’s interior as heavier materials sank towards the center and lighter ones rose toward the surface. “However, if the methane has been continuously replenished from a source then its isotopes would always appear ‘fresh’ and we can’t restrict the age in our model,” adds Nixon. Possible sources include methane clathrates, basically a methane molecule inside a “cage” or lattice of ice molecules. 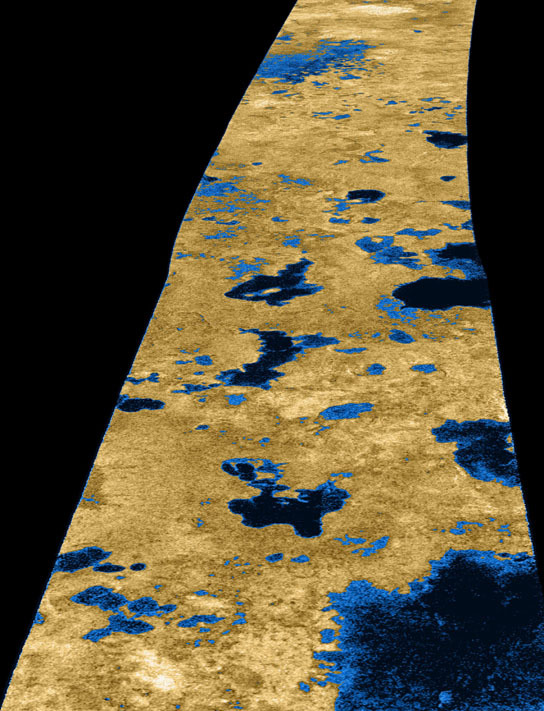 Methane clathrates are found in the frigid depths of Earth’s oceans, and some scientists think there could be an ocean of liquid water mixed with ammonia (acting as antifreeze) beneath Titan’s water-ice crust. If this is so, methane might be released from its clathrate cages during the eruptions of proposed ‘cryovolcanoes’ of water-ammonia slurry, or more simply could slowly seep out through fractures in the crust. The second paper by Kathleen Mandt of the Southwest Research Institute, San Antonio, Texas, and colleagues also models the time-evolution of methane. In this work, the concentration of the heavy methane is determined from measurements by Cassini’s ion and neutral mass spectrometer, which counts molecules in the atmosphere of different masses (weights). Measurements made by the Huygens gas chromatograph mass spectrometer, which also counts molecules of different masses, were used to constrain the impact of escape on the heavy methane in the atmosphere. This research was supported by the NASA Cassini Mission and the NASA Cassini Data Analysis Program grant NNX09AK55G. The Cassini-Huygens mission is a cooperative project of NASA, the European Space Agency and the Italian Space Agency. The Jet Propulsion Laboratory, a division of the California Institute of Technology in Pasadena, manages the mission for NASA’s Science Mission Directorate, Washington. Be the first to comment on "A Closer Look at Titan’s Chemical Production"